MARS has a Facebook page, and many Hornby followers are now posting there. We are working toward establishing a PAYPAL account - thank you for your patience. At this time we can accept donations of Visa - Mastercard by phone. You may send checks to us directly by mail with or without our donation form if you are unable to print it. Please include your mailing information and your email address and we will send you a note acknowleging our receipt of your contribution. Monetary donations are easier for those living in the US since trying to mail over the Border through customs may be difficult. Please make contributions to your local rehab centres but please contact them first to find out what they may need and how much storage they may have. There are many ways to contribute to MARS. Often we are looking for specific items, household items such as Bleach, toilet paper, paper towels, Dawn dish soap, copy paper, B vitamins, and now fruit and berries. Apples and oranges go to feed our mealworms while the strawberries, blueberries and blackberries are fed directly to growing songbirds such as the lovely Cedar Waxwing and Hermit Thrush presently in our care. Donations of CASH help us to purchase the special FAWN milk needed this year. Cash is required to buy mice, quail and medicines for our birds of prey, like the anti-parasitic for our Great Horned Owl or the antibiotics for the little baby barred owl that just had surgery. Cash also helps to buy duck food for the multiple mallard ducklings (and woodduck) in our care. This year we have experienced a lot of expence for some items breaking down due to old age. Our telephones needed replacing. Our water system needed filtration. Our refrigerator died and the old washing machine is on its last legs. Please support our Raffle and look into sponsorship of one of our patients to help support our ongoing work. Thanks for posting the wish list and comments for MARS. It's very helpful to see what they need and how it's used. They need so many things! Right now, money seems to be the best thing to send, either by credit card over the phone or by check. I called and used a credit card and it was very easy. It was Maj Birch of MARS who did so much to have the body of Phoenix recovered, delivered to Courtenay for examination and sent to Vancouver for Necropsy - a process too complex to describe here. Largely because of her personality, she has a large number of volunteers who put in hours to help the cause. 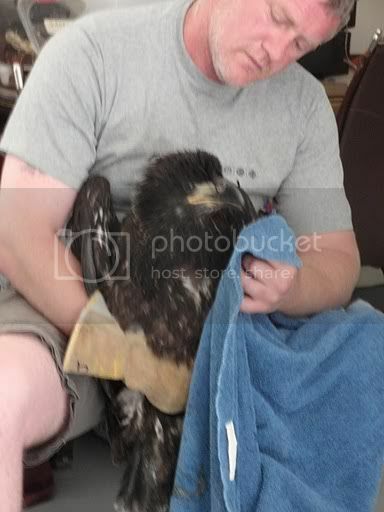 One of the volunteers is a retired pilot who transports injured eagles, seals or whatever to where they can get assistance, using his own helicopter. Phoenix's body was thus flown to Vancouver. 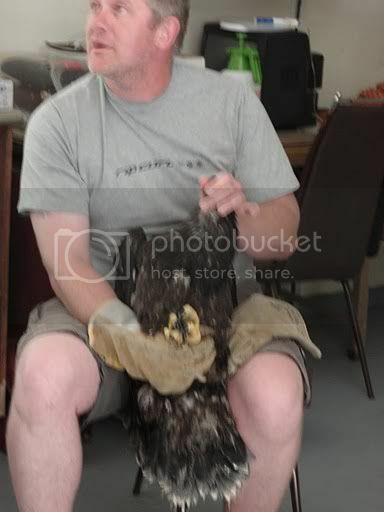 Yesterday I was informed about the eaglet in nest #9 (the next territory north). It had tumbled out of the nest prematurely. It appeared to be alright so it was decided to leave it there where the parents and neighbours could keep an eye on it an see that it is fed. Mountainaire advises us - and there is now some concern it may have an injured wing, so they are sending a volunteer over to Hornby to check it out and do whatever is necessary. Yesterday an abandoned baby seal was reported in this same area. The rule is to watch it for two days and if parents don't show up, then report it to Mountainaire. They came over, captured it and returned it to Courtenay. I just phoned up and the seal is presently on its way to Saltspring Island where there are facilities to rehabilitate it. The seal was believed to be slightly premature. It is now managing very well. It is of interest that the Government of British Columbia decided to spend $500,000,000 to put a retractable roof on BC Place to encourage a gambling casino to open larger facilities. To counterbalance such expenditures, it is necessary to cut back on other (presumably less important) services. 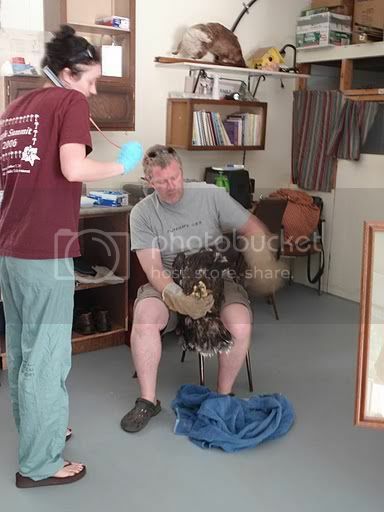 Thus, all funding to animal rescue institutions like Mountainaire Avian Rescue have now been cut off. Hornby Island Eaglet Nest #9, "Niner"
History: The eaglet was seen on the ground on July 21, 2010. boonibarb located the eaglet on the morning of July 24 2010 and after four hours of close observation, contacted MARS. 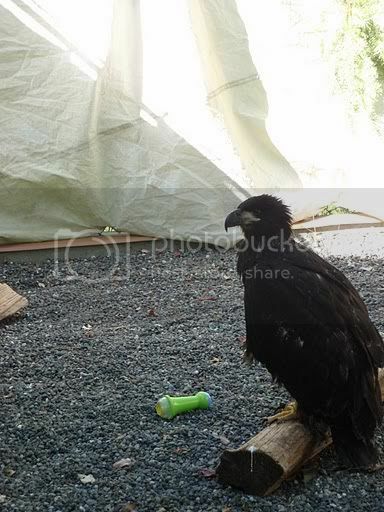 A MARS volunteer traveled to Hornby Island to recover the eaglet. 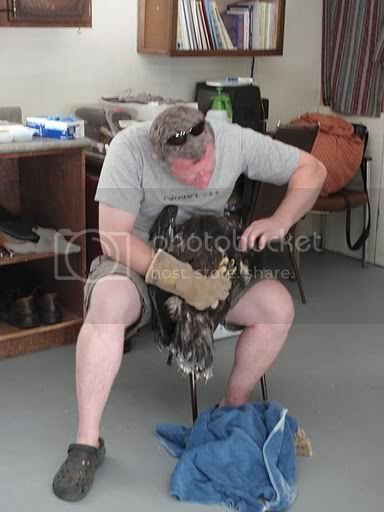 My first examination of “Niner”: I think the eaglet is a male but will confirm gender tomorrow. He has no obvious injuries but his weight is low and muscle mass is not ideal. 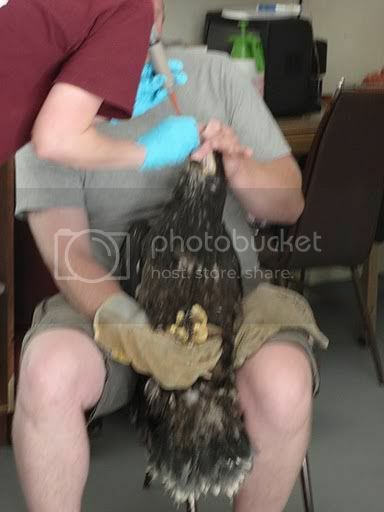 I feel it would be more beneficial to keep this young eaglet in rehabilitation and let the parents continue to care for the sibling in the nest. 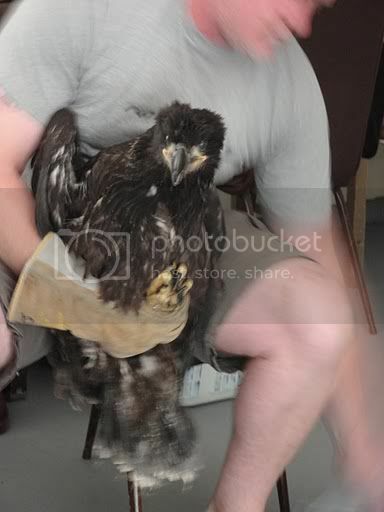 This will increase the sibling’s chances of survival post-fledging and Niner will be able to regain lost weight, put on some muscle and develop his flight muscles in rehabitation. Eventually he will be moved to another rehabilitation centre for more flight conditioning in a larger flight pen, as we currently do not have one due to constraints. There must be nothing more comforting than to know that "he" is in good hands. Or I should say, he went from all of your good hands to another pair. Oh what a good news story and yes booni, I agree with you...Maj is wonderful, but hey...so are you. I shudder to think of what would have happened had you not found the little guy. As I watched him screech and wander, I was terrified he'd go into the path of a car. That's a sad scenario, to see the Government wasting millions of dollars to put a roof on BC Place and cutting back on funding for more important things such as MARS. Several news organizations did a story on Phoenix. Maybe those who are local to them, should write the news editor who did them? I have copied it here because I would think that Niner may be moved to the North Island Wildlife Recovery Centre (NIWRC) which is very dear to our hearts. 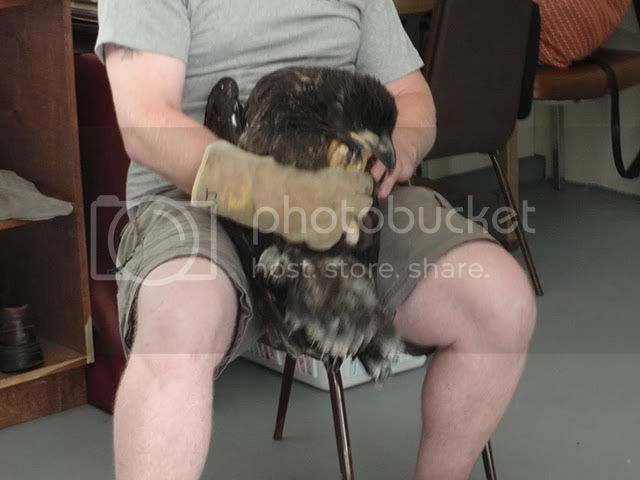 We sponsored the release of a young eagle there. 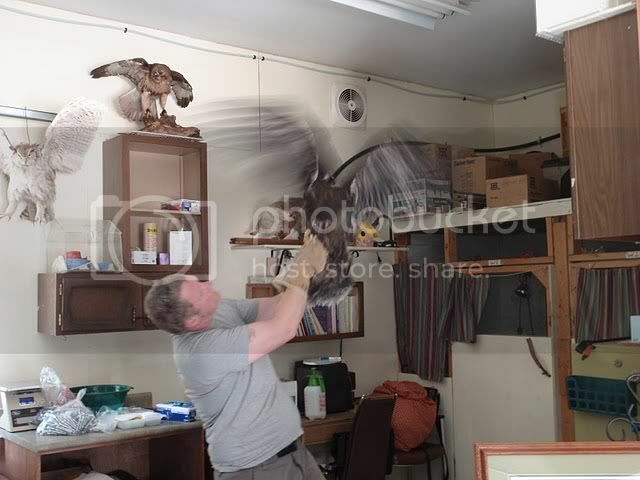 They have the largest eagle flight cage of its kind in Canada. There is a thread for NIWRC in this area of the forum. JoyofDogs http://www.ournaturezone.com/index.php?action=profile;u=880 is a volunteer at MARS. 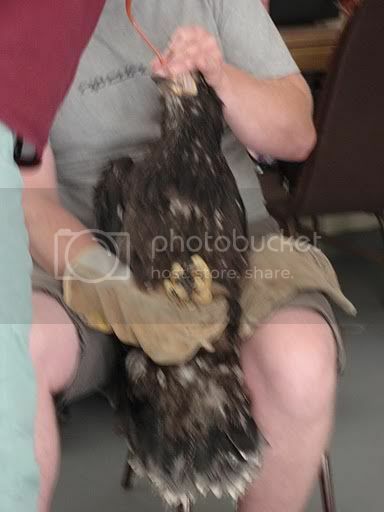 She asked that we post the pictures of "Niner," the eaglet from Nest #9 on Hornby Island that was rescued and brought to MARS. See the pictures below. On July 21st, it was reported that “Niner,” had oops’ed out of the nest leaving his parents and a sibling. On July 24th, boonibarb found Niner on the ground and after four hours of close observation, contacted MARS. 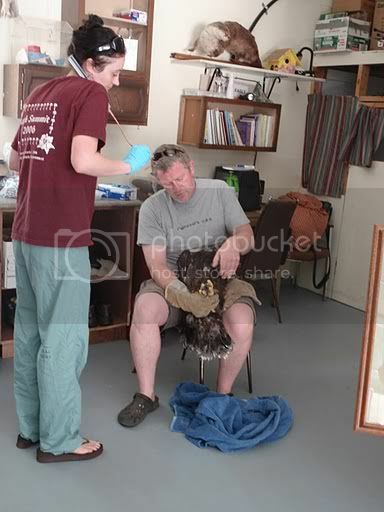 A MARS volunteer traveled to Hornby Island to recover the eaglet. Joyofdogs took pictures of Niner at the MARS facility yesterday. The comments come from her. See below. Reg holding Niner – easy boy. Checking his wing strength. He can flap which is good but his muscle tone is poor. Don’t want to overtire him. Wing stretched out. Checking muscle tone. Intern getting ready to feed yummy herring puree. His beak must be pried open so a tube can be put down his throat - beak is razor sharp. Open tunnel – here comes the choo choo. 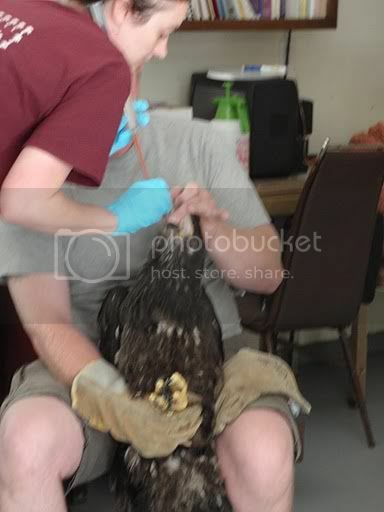 Checking ears for injury from the fall from the nest. It is ok Niner, this won’t hurt. See Niner outside in tented enclosure. JoyofDogs could only peek inside to take these pictures. 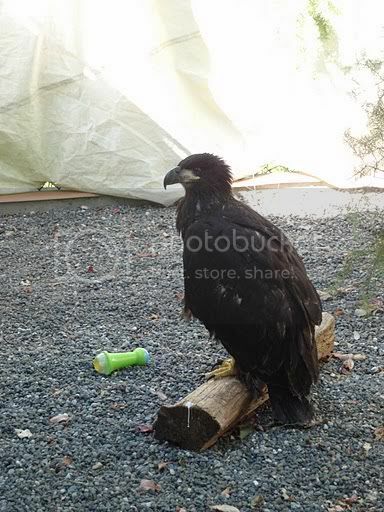 Brigantine Nest, Hornby Island Eaglet "Little Brig"
History: The eaglet was grounded approx. July 19 2010 and located by boonbarb on the morning of July 26. After observing, she contacted MARS. 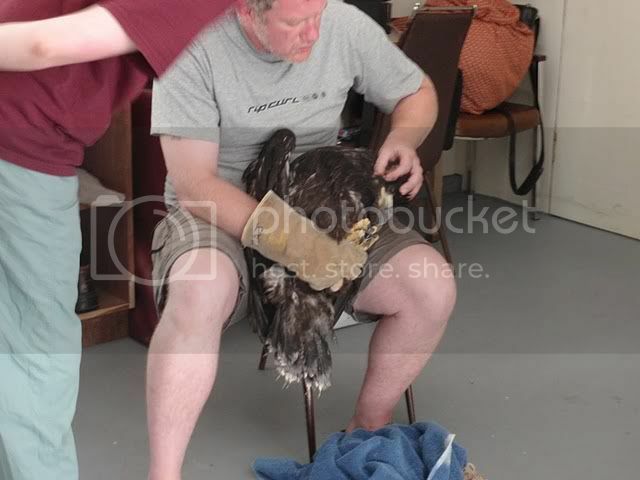 The eaglet was captured that evening and transported by helicopter to MARS on the morning of July 27. 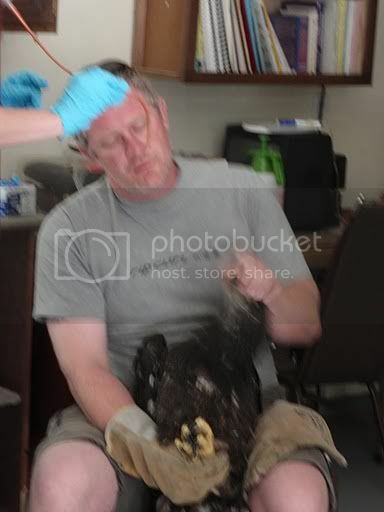 Initial examination showed the eaglet (believed to be female) to be heavily infested with ectoparasites. Her weight is low. She has been treated for dehydration and parasites and will continue to undergo evaluation. Lil Brig in good hand now, thank goodness. I hope that they got her in time to help her get back to normal. It will be interesting to hear what Joy has to say about her time volunteering at MARS today. She was supposed to be there before Lil Brig arrived, so we may get more photos, too. Yay Hornby Eagles Advanced Rescue Team...HEART for short.